Friday night’s snowfall fell with little wind and left a thick coat of snow on Ben Nevis. It snowed continuously on Saturday so the mountain now looks very wintry. On the classic routes, heavy snow over bare terrain made for testing conditions – two parties climbed Tower Ridge taking over ten hours apiece as they struggled to overcome low angled slabby terrain. Normally these sections are straightforward with a base of underlying snow, but the two feet of fresh powder on blank slabs offers neither purchase, nor any clues as to where the holds and lines of weakness may be. As the snow firms up conditions will rapidly improve. Steep snowed-up rock routes high on the mountain were the order of the day. 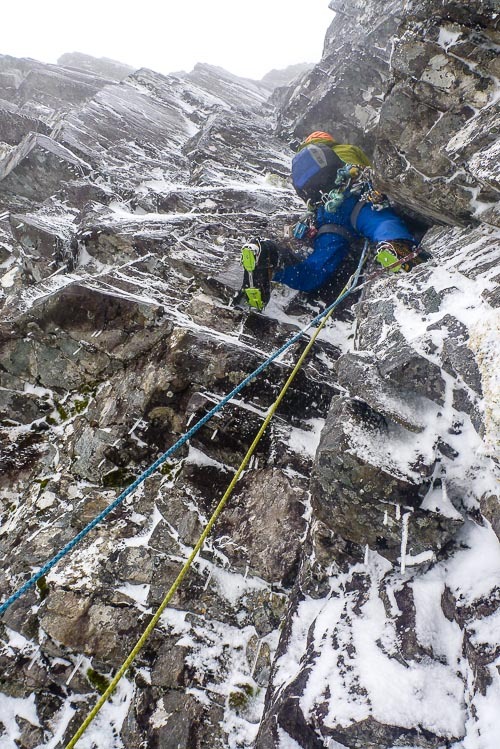 A couple of teams battled up The Slab Climb on South Trident Buttress on Saturday, but better weather on Sunday March 5 saw another ascent of The Slab Climb, together with successes on Gargoyle Wall and Darth Vader. The two highlights of the day took place on Number Three Gully Buttress. Dave Almond, Dave MacLeod and Helen Rennard made an early repeat of The Knuckleduster (VIII,9) climbing the direct version first climbed by Greg Boswell and Guy Robertson in November 2012. Meanwhile, Greg Boswell added a superb direct finish to Babylon. Instead of traversing right and climbing the hanging chimney, Greg climbed straight up the soaring arête directly above the Gargoyle Cracks, which is arguably the most striking architectural line in the corrie. This entry was posted in Commentary, New Routes, Repeats and tagged Ben Nevis, Dave Almond, Dave MacLeod, Greg Boswell, Helen Rennard. Bookmark the permalink. Thanks Andy, you are correct. I was confusing it with the direct finish added by Greg and Will the previous season. Hey Simon. Good to see you in the Ben. The finish I did looks like it was probably Rock of Ages? Originally done in the 2007 international meet by Es and Rok. Still an awesome bit of climbing though, and we’re not sure if we we’re further right still. Either way was good fun. Well done whatever you climbed. Looking amazing up there today, inversion. I’ve got unmovable work. Arse. No we went up the thin seam crack to the right of the wide crack Es. Steep thin blind torques. The wide crack looked nails, good effort!